It’s so hard not to pick All the fabrics for my Spring fabric palette! I want them all! A friend confessed to me that when she is feeling anxious about her financial situation, she comforts herself with buying fabric. I know this feeling! I’m currently on a spending freeze while I try to work my way out of a little debt. I can give up coffee, new shoes (temporarily), movies, nights out and I’m even okay with the size of my yarn stash, but I really want some more fabric! Add to this, that I am trying to Sew With A Plan, so that I have items that play well with one another, rather than orphans in my wardrobe. 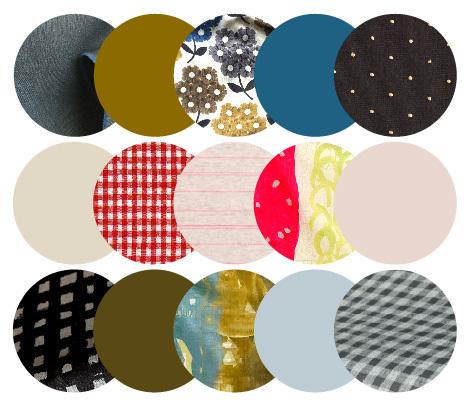 I’ve put together a Spring Palette of colour and fabric choices (illustrated in the header). I’ve included plains and patterns (small and large scale), brights and muted colours, knits and wovens. There is an emphasis on muddy colours, with some bright accents. Spring is like that, muddy with bright yellow daffodils and crocuses and sprigs of hopeful, luminous grass. I’ve gone mining in my stash for suitable fabrics. 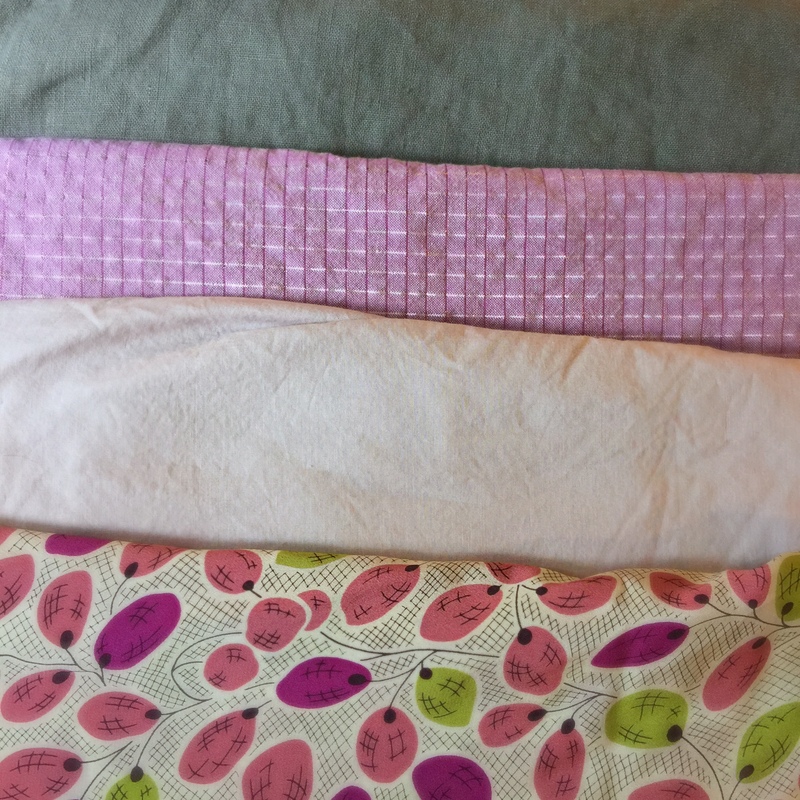 Some Spring fabrics from my palette, in my stash. I’m planning on using the top grey linen for an Alice Top dress with V-neck. Should I embroider the yoke? maybe with something simple like dark french knots? I have already used that Loominous, check fabric. 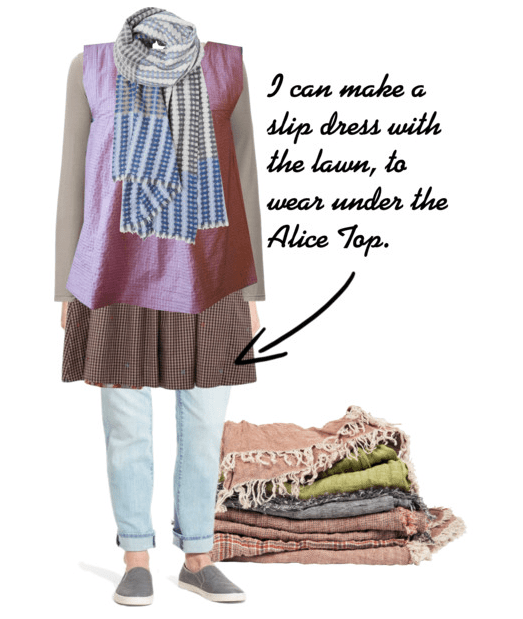 The pink lawn, could be a simple slip dress with pockets to wear with the Alice top, to visually extend the length of it. I have enough floral silk to make a dress. I’ve had that Liberty print silk for years. Time to use, it I think. I might get more use out of a long tunic. Any suggestions? I don’t have any tobacco/golds or small, neutral prints in my stash, though. I really like the gold colour with greys. I think this would be a good transitional palette for clothes in the autumn too. I really want some small prints, spots or stripes. Maybe I will resort to dying some fabrics. Or I could add some small embroidery embellishments to a grey fabric in my stash. I better go mining again and see what else I can find. That “friend” sounds familiar;) Love your fabrics. What other pieces are you planning to sew that will work interchangeably?